Glance through our gallery of deck-building shots. Take note that adding a finished floor to your yurt is an easier (though not necessary) process when done prior to the yurt going up (far fewer detailed cuts). 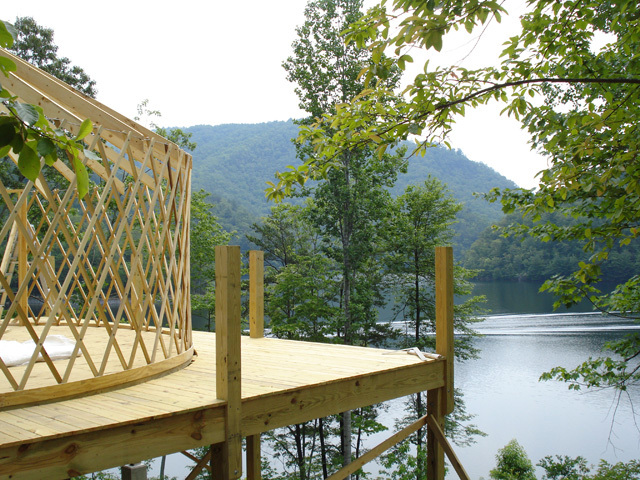 Doing so requires close weather-watching and pre-planning so that your yurt can go up immediately after your floor. Otherwise, the floor needs to be well-protected from the weather until it does. -All of the SIPS need to be splined together with OSB spline on the long edges and 2''x4'' on the short. -It is highly recommended to buy a foam scoop- which is a bend electrical heating element similar to a stove. The scoop. lets you carve out the foam so that the 2x4's can be inserted. The scoop costs ~ $135 and can be found online from a company that makes branding irons. -To cut the curves, one option is to use a Prazi saw, which attaches to a circular saw. It costs ~$150. To make the cuts, support the whole panel at the edge, and then scribe it with a rigid compass, made by fastening a 16' piece of wood to the center of the platform with a hole drilled in it for a pencil. Take the panel and put it on saw horses to cut. (To avoid getting the foam from the SIP everywhere, you can use a shop vac right next to the running blade). Spray the blade after every 2' of cutting with silicone lube. -the SIPS are fastened down with 6.5'' coated self-drilling screws, available on Amazon. Fasten the panels every 2' into the beams and joists. -----The floor is dead solid and suitable for a hardwood floor atop. 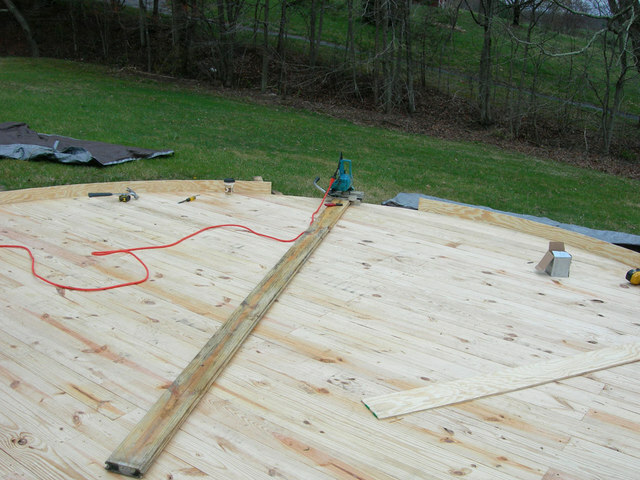 -The edges of the SIPS running around the platform can be blocked with a 2x4 cut at around 23'' with a 6-degree miter. This seals them up and provides a good nailing surface for the edge board. -The bottoms of the SIPS can be painted to protect from weather. Erecting your yurt can be a fun process completed in a day with friends, focus, and fair weather. Follow these instructions carefully, and in sequential order. Want help? We are happy to provide both transportation and installation options. Delivery is $1.25 per mile. For a $500 fee, our crew can direct and oversee setting the yurt up with several unskilled helpers you provide. We can also coordinate a crew for hands-off, turnkey installation. Most yurts are up and under cover in a day. Please email info@blueridgeyurts.com for specifics.